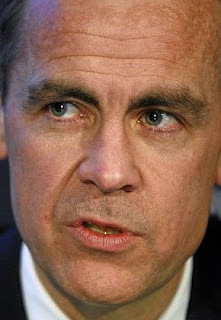 The presence of Carney at this year’s Bilderberg confab undoubtedly helped him curry favor amongst the global elite and helped him to secure the position as Governor of the BoE, just as it has aided other luminaries in exalting them to higher office, such as Herman Van Rompuy, who was picked as President of the European Union just days after he attended a Bilderberg Group dinner meeting. Carney’s ascension to BoE head also represents the final piece of the jigsaw puzzle in Goldman Sachs’ quest to control virtually every major economy across the European continent. Last year, former EU Commissioner Mario Monti was picked to replace Silvio Berlusconi, the democratically elected Prime Minister of Italy. Monti is an international advisor for Goldman Sachs, the European Chairman of David Rockefeller’s Trilateral Commission and also a leading member of the Bilderberg Group. “This is the band of criminals who brought us this financial disaster. It is like asking arsonists to put out the fire,”commented Alessandro Sallusti, editor of Il Giornale. Papademos ran Greece’s central bank while it oversaw derivatives deals with Goldman Sachs that enabled Greece to hide the true size of its massive debt, leading to Europe’s debt crisis. Papademos and Monti were installed as unelected leaders for the precise reason that they “aren’t directly accountable to the public,” noted Time Magazine’s Stephen Faris, once again illustrating the fundamentally dictatorial and undemocratic foundation of the entire European Union. 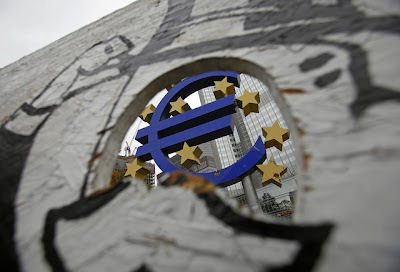 Shortly afterwards, Mario Draghi – former Vice Chairman of Goldman Sachs International – was installed as President of the European Central Bank. The U.S. Treasury Secretary at the beginning of the 2008 financial collapse was Hank Paulson, former CEO of Goldman Sachs. When Paulson was replaced with Tim Geither, Goldman Sachs lobbyist Mark Patterson was hired as his chief advisor. Current Goldman Sachs CEO Lloyd Blankfein has visited the White House 10 times. Goldman Sachs spent the most money helping Barack Obama get elected in 2008. 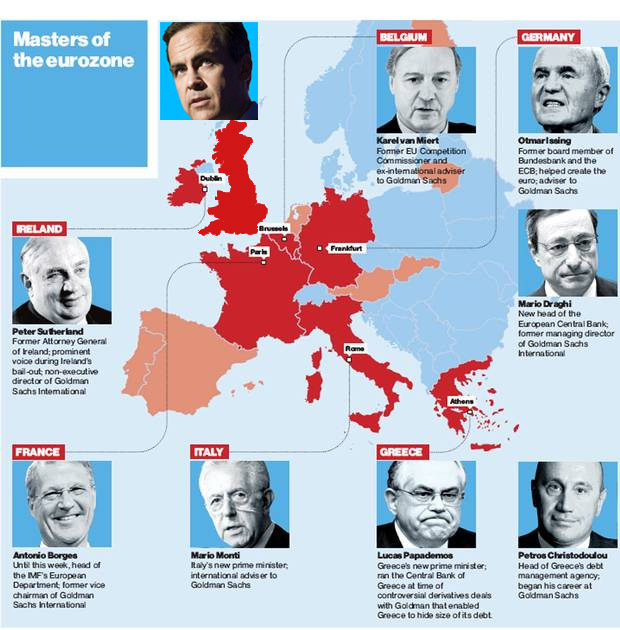 As the above image illustrates, the economies of France, Ireland, Germany and Belgium are also all now controlled by individuals who harbor a direct relationship with Goldman Sachs. The international banking giant, notorious for its corruption and insider trading, now has massive influence over virtually every major western economy on the planet.